Google Now is an incredibly useful personal assistant which works by serving you Now cards according to your data present in your Google account. It is available for Android and iOS. You can tailor your Now cards according to your taste by swiping it left or right. You can add your interests such as your favorite teams, etc., from which you wish to receive updates. Everything you do on Google Now is recorded and even, if you dismiss the card, the action is recorded in the Now cards history. To review your Now card history on Android, go to Google Now -> “Settings” (by clicking hamburger icon) -> “Now cards” and select “Manage card history”. You will be able to review your entire Google Now cards history. There isn’t an option to do this in iOS. 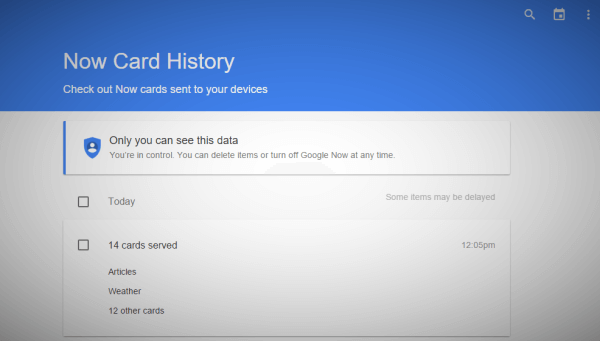 View your Google Now cards history on desktop. If you wish you to remove your current preferences and get started from scratch in Android, go to Google Now -> “Settings” -> “Now cards” and select “Delete card preferences”. This will delete your preferences and turn off Now cards on all your devices. Additional tip for Android – The latest update of Google Now launcher changes the App drawer to vertical scrolling with recently used Apps displayed on the top of App drawer. To disable this, go to Google Now -> “Settings” ->Toggle off the “App suggestions”.